Today I want to talk about a tool all bloggers treating their blogs as a business should at the very least be familiar with—and should probably be using. It’s something that has the potential to drive significant traffic to your blog in the coming years. It could also add significant profits to your blog in that time. It is a tool that can be used in a variety of ways. It isn’t overly expensive to set up, and it’s not difficult to use. The tool is the email autoresponder—something that is central to my own blogging business today, but whose power I ignored for several years. In this post, I want to introduce you to the concept of autoresponders. Later, I will highlight a number of techniques for using them to drive traffic and profit. Autoresponders are a tool that most email service providers offer. An autoresponder is a sequence of emails that will be sent to anyone who subscribes to them. The emails are set up to go out at predetermined intervals to a user who subscribes to your email list. The service that I use for my autoresponders is Aweber, but most providers offer them. 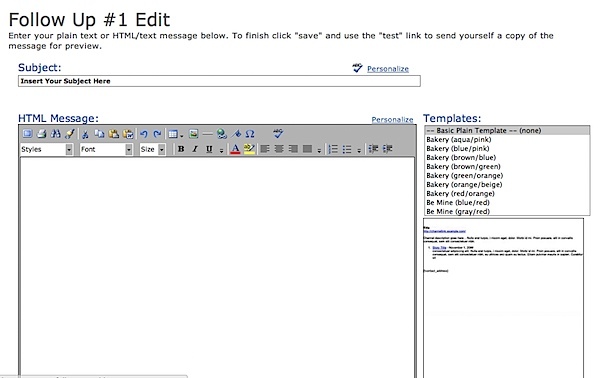 Using Aweber to set up a sequence of emails is simple. Set up a list: Log in to Aweber (once you’ve signed up, it’s free to test drive), and then hit Create a New List. Enter your list name and details as prompted. Aweber will also get you to come up with a “confirmation message.” This is sent to anyone who signs up for your list so that they double opt-in to receive your emails. Add your first email: Once your list is set up, head to the Messages tab in your Aweber account and choose the Followup option from the drop-down menu. Hit Create New Followup Message, and you’ll be taken to a page where you can create your first email. This page is pretty simple to set up—you just need to enter a subject line and the message you want to send. This being the first email in your sequence, you’ll probably want to welcome people to the list and set some expectations about what will follow: when they’ll get their next email, and what the emails that follow will be about. Once your email is ready, hit Save. Since this is the first email, it’ll be sent to anyone who signs up to your list immediately upon signup, so do get this email right before you invite people to sign up. Create further emails: With your first email in place you can now begin to develop your sequence of emails. What goes into these emails will depend a little upon your goals for the autoresponder (tomorrow I’ll highlight a few potential strategies), but whatever you put in them, you will also want to think a little about the interval and delivery times of these next emails. When you’re editing these emails, look under the space in which you enter them for the area where Aweber lets you set mailing intervals. The “4″ signifies that this second email will be sent four days after the welcome email. You might want to lengthen or shorten this timeframe depending upon what the autoresponder is for. Click the check box below this to specify times and days on which you want emails to be delivered. In this case I’ve chosen to have the emails delivered on any weekday, between 9am and 12 noon, based upon the subscriber’ timezone. If you’re sending daily emails, you will want them to go out every day of the week; alternatively, you might choose to mail weekly on a certain day. Once you’ve got email #2 in place, repeat the process with further emails. Promote your list: Once you’ve got your welcome email and perhaps another couple in place, you can promote your autoresponder to get people to sign up to it. You can do this in a variety of ways using the Forms that Aweber provides. How you promote your autoresponder will depend on what the autoresponder sequence is about. What can you use an autoresponder for? Okay, so you know how to set up an autoresponder sequence in Aweber, but what can you actually do with it? I’m going to follow up this post later with another post that answers just that question, and shows you a number of different ways bloggers can use autoresponders to drive traffic and bring in revenue. In the meantime, I’d love to hear how those of you who already do use autoresponders use them in your blogging. Please share your experiences of them below in the comments section!